I’m still here. I suppose you gave me a little thought when you read that N.T. area had been raided by 18 Jap planes on Friday night. * Well, your little Willie was right out of it. It occurred during the middle of the party I spoke of in my last letter. We were all gathered around some tables in the middle of the bush not far from one of the air strips (as they call the aerodromes here) when the warning came over. Some of the pilots had to dash off to their Spitties. The lights went off and we continued our drinking in the bright moonlight assisted by the light of a parachute flare which one of the Jap planes dropped over the area. Old deafie didn’t hear the planes – there was so much alcoholic conversation being broadcast. A moment later ack-ack fire started – booms & flashes split the night. Shrapnel from the bursts fell in the camp where I stayed last week. Fortunately for us the Japs weren’t after the fighter planes – they flew past & dropped their eggs near 2 bomber fields. One of these I described to you as being situated in the hills. I stayed there on Wednesday night. The yellow boys might just as well have saved their time, petrol and bombs as neither damage nor casualties (so far as I have heard) were inflicted. So – a miserable flare is all I’ve seen of the war up in this front line. There appears to be an expectation of another bash tonight – it being a magnificently full moon. Perhaps it is just as well I’m not in Darwin or staying in a bomber camp, although they tell me that even a poor bloody Allied Works Council camp stopped a stick of bombs last night. The only physical stress I have collected is plenty of bites – and then some. I scratch like a lousy old dog. The party was pretty willing while it lasted. Met a Spitty pilot from one of the squadrons who asked how both you and I were keeping. We met him outside St James theatre with Paul Brennan and some others just before they left for Canada two years ago. Have just been asked if I’d like to go down to an American bomber field tomorrow. Think I’ll go down & see what sort of holes the bombs made. I don’t know that it would be terrible healthy to stay down there – I’ll see about that later. Cripes I’m missing you honey. Am really looking forward to getting home. This life of celibacy is not what it’s cracked up to be. You’re in for a torrid time my chicabiddy when the bronzed old boy gets back. I don’t know that you’ll go much on my colour/pattern – I’m getting browned as far as the waist only, from there down snow white takes over. Have been letting my mo grow a pace – perhaps you should buy me a moustache cup. How are the Watson family coming along? How’s the concrete idiot child? And Bib & Bub? Very quiet night – we are all sitting round like little goody boys – all writing to our dearests and sweetests. All of which refers me back to wimmimck(?) How’s Tommy’s Art for arts(?) sake? Has he had the animated Selina out again? Did you see her stripped – is she still much the same? I get up early – as a rule before the sun. The night passed off without incident which is all very well. 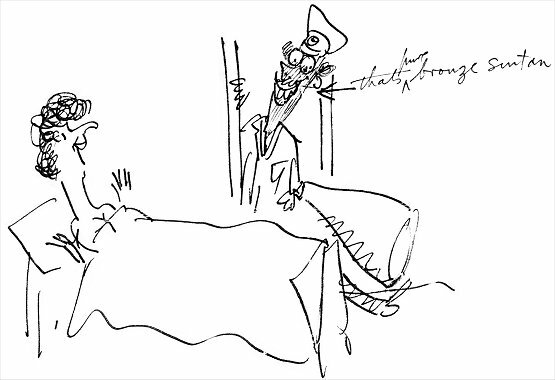 Called at a Sergeants’ tent before going to bed. They were all on the jungle juice – a potent and horrible brew of their own manufacture made out of anything they can lay their hands on – prunes, dried fruits – potato peelings, jam – sugar & old boots, topped off with a liberal dose of yeast. It looks like milk bar washing up water and tastes and smells like old yeast. It is alleged to turn the mildest of men into maniacal dervishes. I didn’t have any. The conversation was still on the dames and what they would do to them on return to the flesh pots of our fair city in the south. That’s all for the moment, dear Willie is signing off. Get your squeezing muscles ready my sweet for the old boy won’t be long now. (I hope!) Love in bundles for Jessie. No 1. I live in tents – i.e. at different places – not in tents at one time. No 2. A pilot wrote that on your letter – he was in his cups – I’ll decipher it for you later. 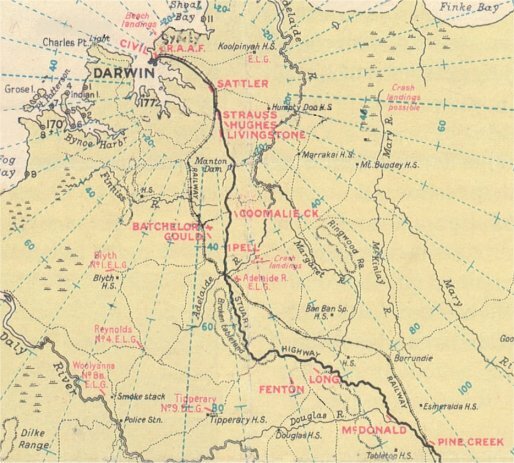 Fighter guide map of airfields near Darwin (from Peter Dunn’s Australia@War). Wep was probably camped just north of Manton Dam near Hughes airfield which had Spitfires along with Strauss and Livingstone airfields. After posting yesterday’s letter I had a most welcome surprise. One of your letters was delivered to me via the good graces of an Officer who had been in Darwin. It was quite a treat. I have a box of 200 cigs put away for you. I can’t bring anything else much down because I will still have weight limits to consider on the place trip. See if you can buy some poultry shears. I don’t know what I want – leave till I come home – it won’t be long. Whacko the dinner – and after?! Your letters ar’nt censored. So speak freely. Am back now with the crowd from Sydney. Amused them all last night with mad sketches of them waiting for a shower and straining at the stool. They were well received. Prior to the padre’s (there is one here at the moment) departure last night the drawings were strictly on the up & up. One of the Captains here took me for a run to the dam which supplies Darwin with water. It’s a pretty big affair and water is held back for about 7 miles. The Manager of the plant there lives in a delightful cottage overlooking the river which flows from the foot of the spillway. Tall and gracious ti trees intermingled with pandanas palms and eucalypts shade the languid water lilies. His house on the hillside is surrounded with the greenest pawpaws, bananas, jacarandas and gums. A rustic fountain plays amid tropical lilies speckled like coleus. Bush orchids hang on the trees, citrus fruit, chrysanthemums, flocks and tomatoes add variety to the pattern. Hanging baskets of purple backed leaves complete the picture. The dam itself is full of fish which we could quite plainly see – perch – garfish – & one tiny snake swimming on the surface – a boat is moored nearby. It’d make a wonderful weekender. Apparently anything grows at any time during the dry season. The ground is extraordinarily indulgent when supplied with plenty of water. The climate is getting one a bit lazy now. Also I am becoming somewhat rattled as time is drawing to a close – there are so many odds & ends I want to check on. I suppose I’ll find I haven’t half enough stuff or have overlooked something – when I start in re drawing it all. Next weekend I am flying over to a mission station where are plenty of blacks etc. Should be a wad of material in it. Native dances, tropical scenery. Air force base, shipping scenes, crocodiles – in fact – the whole works. You can’t help but be amused at the conversation in the territory. Only 2 basic topics – women & beer discussed ad infinitum. Lurid speculation precedes the arrival of the Tivoli ballet. I shudder to think of the boys’ conversation after each performance. Have borrowed a pair of shorts from the Loot at Darwin, hoping to get my legs a bit sunburnt – so far all I have collected is several hundred sand fly bites. A microscopic fly with a Gargantuan bite. Am due at the big do tonight so cheerio whilst I am still whole & healthy. How’s my little pet today? Listening to Janie? Going to the pub? Reading to the Watsos? Or just thinking of Willie? Am at another camp where I stayed last night. 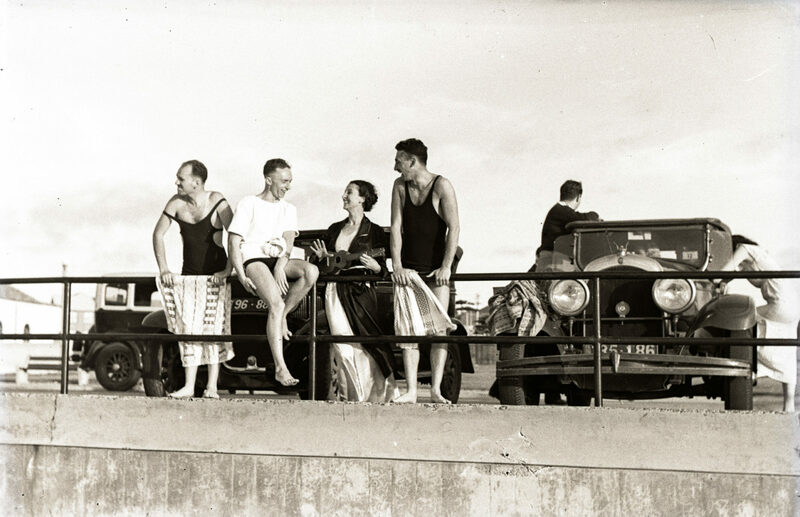 Am moving up the road this afternoon where I shall pass the evening with the Sydney fellows from the Auto Club. The crowd of pilots fly Beaufighters, a twin engined job used for strafing the nips on islands 300 to 400 miles from here. They are somewhat older than the Spitfire boys but are all in early twenties. The Commanding officer is youngish tall, dark & could easily pass for a brother of Good-O. Something about his face is remarkably like her. The air force COs are much more friendly than their counterparts in the army. I suppose this is so because they are much younger. An Army Liaison officer attached to this unit came up to me last night and asked if I was wep. Said he thought he recognised me. Asked if I recollected trying to cook sausages with a blow lamp in the main street of Tamworth. He was at the dance at Tamworth Golf Club. Fancy coming 2,000 miles to have that brought up! Wep, my girl, is a name to be contended with! – A young chap of 23 took me in tow last night & fed me with a few whiskies. At ten o’clock we suppered on toast, asparagus and SARDINES! Sorry I can’t bring you any down but I am not supposed to buy anything from their mess store. In case you get the wrong idea that I am wallowing in epicurean luxury I might add that the usual mess meal is only too often blasted tinned bully beef – (tasteless goddamn stuff) & margarine which no one I have so far struck is inclined to eat. Dry Bread is the standing order now. It’s 3 weeks since the troops have had any butter. You can imagine my sufferings. This is the best camp I have been in. Situated on the slopes of one of the few hills around this country it is sprinkled amongst delightful open forest. Beautifully green trees, plenty of palms – and birds galore. Dawn is a rare pleasure – you wake to the low and penetrating calls of the birds, and the air is as soft & cool as a whisper. The shower is the coldest I’ve had up here – dispersed my crumbiness in a trice. Gave the old sand fly bites their necessary scratchings & offed to breakfast of bully beef rissoles and tinned bacon. For heavens sake get some sucker down there to eat ours. I’ve completely had it. Practically every morning since I arrived. I never want to see it again. It dished up like limp ham boiled in washing up water. I’m afraid you and I will have a few guests when I return. So many of the lads have been very kind to me. I have asked them all to give us a ring if & when they are in Sydney. Hope to see you soon sweetheart. Better get all beautified for you birfday & little Will. Lots of kisses. Wish I was at Darwin in case I get a letter. Got another letter from you posted the 6th. Thanks sweet you’re doing very well indeed. Sorry you haven’t had any mail for 5 days. I can’t understand that as I don’t think at any time have I gone longer than 2 days without sending you something. Maybe a censor somewhere has tossed one out. Why I wouldn’t know. Sometimes I get fed up with it here. I think I’ll just clean up a few more things & come home within 3 weeks. To cover everything would take me months. So get ready to receive me right. Am looking forward to seeing you again – it does seem such a long time – doesn’t it? Wrote 4 letters on Sunday to you, George Finey, King Watson, and the boys at the office. So that’s that. I was quite exhausted after it all. We have all been washing & ironing today as the batman is sick. Frank Tierney knows all about the job. I think he must have been a good wife to somebody. Yesterday I spent with a bomber squadron and managed to get a good set up of the ‘erks’ (as the air force call the ranks who do the hard manual work) loading bombs into a plane. Sunday afternoon I make a very quick note of a funeral near here. Two of the mercantile marine seamen who were killed when Japs bombed a ship a few days ago off the coast north from here. I think it would make quite a good picture. Made a quick water colour sketch of one of the bombed houses here. Water colors are hellishly awkward to manage out of doors. The colour dries on the box before you can get it onto the paper. Am dashing this letter off because I’m going up the road a little way to finish off a painting of a swimming pool I started some time ago. As the mail will go before I return I am in haste to express my adoration. You must be stopping a packet of cold weather down there. The “Army News” (local paper) mentions it nearly every day. Yes I am getting sunburnt. Poor old nut had peeled several times and is now sweetly crowned with a tiara of freckles. Borrowed a pair of shorts from the Loot yesterday so hope to lose the lily whiteness of my nether limbs. It’s a hot day but with extra pleasant cool breeze coming off the sea. The climate here much to be preferred to that down the road where there is a great lack of breeze. The water pipe line feeding Darwin is exposed to the sun and the water from it is incredibly hot where it is tapped into camps alongside it. Almost to hot to shower under. In Darwin you can have a shower any old time night or day & it’s just beaut-o! Will be off to the pictures tonight to see “Sun Valley Serenade” again. Be pleasant to see Sonia skiing whilst we swelter & combat the mosquitoes. Guess I’ll have to be getting along it is now almost 3pm. So put your arms around yourself for me & save me some great big kisses. Lots of love sweetheart – till I see you soon.